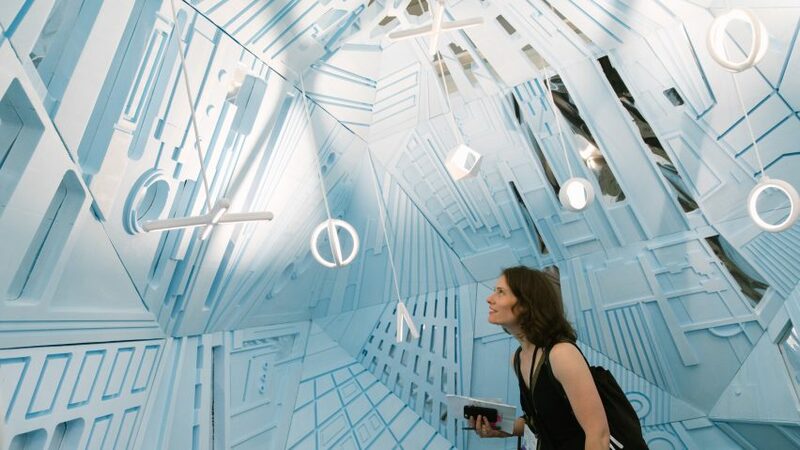 Products to aid those with memory loss and an exhibition stand made from carved blue foam and mirrors are among the award winners at this year's International Contemporary Furniture Fair in New York. This year's Editors' Awards were chosen and presented on the first day of ICFF, which runs 21-24 May 2017 as part of the citywide NYCxDesign festival. Dezeen US editor Dan Howarth was on the judging panel, alongside Annie Block of Interior Design, Melissa Feldman of Stroll Productions, Sheila Kim of Architizer and Paul Makovsky of Metropolis. Together they selected winners in 12 categories. New York's Pratt Institute received the Wellness award for a collection of homeware and furniture designed to improve the lives of those suffering from Alzheimer's disease, which affects memory and other mental functions. Meanwhile, the School Installation award went to the University of Cincinnati's colour-coordinated display of products created through a cross-department collaboration. The winners of the Booth Design prize were Two Parts and Katie Shima, for a compact space lined with blue modelling foam cut into sculptural shapes. The booth was used to showcase the Brooklyn company's ceramic LED lighting. Trueing, a Brooklyn-based design studio set up just four months before the fair, received the Emerging Designer accolade after presenting a set of table lamps with spinning dichroic disks. Recognition for lighting was split into two: a ceiling spotlight that pops out of its fixtures by Delta Light won for Architectural Lighting, and a spherical design with circuits of LEDs inside by Jason Krugman Studio snatched the trophy for Decorative Lighting. Chairs made from repurposed boat sails by Dvelas won the Outdoor category, while Blå Station's simple modular sofa system named Bob took home the Seating award. Material Innovation went to Shore Rugs for its floor coverings woven from silicone strips, Textiles was given to Louise Gray's soft-toned quilts and coverings, and the Kitchen/Bathroom winner was the Nice Collection of transparent taps by Fantini. Finally, the Collection award was presented to Crème's Exchange wooden furniture series for Stellar Works. ICFF, which features on the first Dezeen Hot List, takes place annually at the Jacob K Javits Center on Manhattan's West Side.